L-R: Lisa Pottie, Director of Development and Donor Relations, McMichael; Laura Mirabella, McMichael Board Trustee; Andrew W. Dunn, Chair of the McMichael Board of Trustees; Majid Jowhari, MP for Richmond Hill; Carl Spiess, McMichael Foundation Board Member; Deb Schulte, MP for King–Vaughan; the Honourable Pablo Rodriguez, Minister of Canadian Heritage and Multiculturalism; Mickey Palha, Associate Director, Individual Giving, McMichael; Laurel Saint-Pierre, Head of Exhibitions and Publications, McMichael. Photo courtesy of the McMichael Canadian Art Collection. 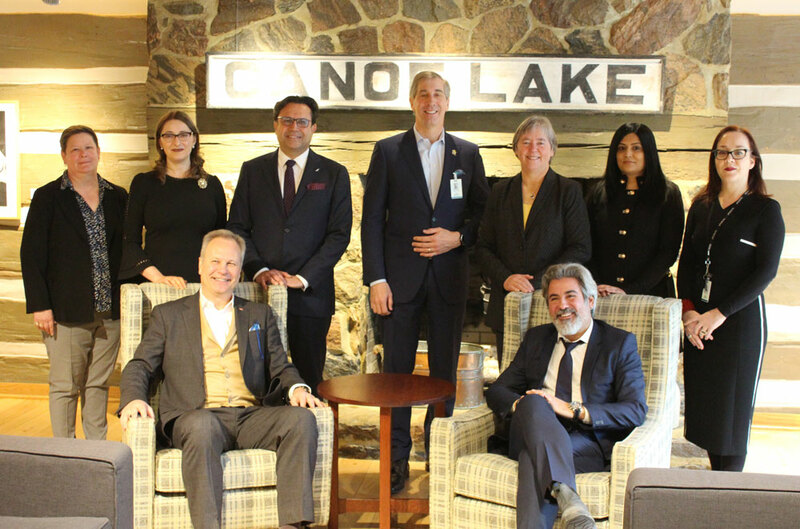 March 18, 2019, Kleinburg, ON – The McMichael Canadian Art Collection was delighted to welcome the Honourable Pablo Rodriguez, Minister of Canadian Heritage and Multiculturalism, for a tour of the McMichael collection and special exhibitions on Thursday, March 14, 2019, accompanied by Deb Schulte, MP for King–Vaughan, Majid Jowhari, MP for Richmond Hill, and Andrew W. Dunn, Chair of the McMichael Board of Trustees. The Minister toured the galleries in English and French with Laurel Saint-Pierre, Head of Exhibitions and Publications at the McMichael, and enjoyed coffee in the Founders’ Lounge, the heart of the McMichael’s original home. The group also had the opportunity to stop briefly in the vault to view treasures from the collection not currently on display. The McMichael Canadian Art Collection is an agency of the Government of Ontario and acknowledges the support of the Ministry of Tourism, Culture and Sport, and the McMichael Canadian Art Foundation. It is the foremost venue in the country showcasing the Group of Seven and their contemporaries. In addition to touring exhibitions, its permanent collection consists of over 6,500 artworks by Canadian artists, including paintings by the Group of Seven and their contemporaries, as well as First Nations, Métis and Inuit artists. The gallery is located on 100 acres of northern landscape and hiking trails at 10365 Islington Avenue, Kleinburg, north of Major Mackenzie Drive in the City of Vaughan. For more information, please visit mcmichael.com. *THE ART OF CANADA is an official mark of the McMichael Canadian Art Collection.